It is important to note that Australia was no longer a British colony at the time. Still, the Australians allowed the British to test nuclear weapons on their territory. On this day, the UK made its first nuclear weapons test in its history. In this way it became the third nuclear power in the world, since the only other countries to possess such weapons were the USA and the USSR. The British decided to test their new weapon in far-off Australia. It is important to note that Australia was no longer a British colony at the time, despite the fact that British queen Elizabeth II was also the Queen of Australia (and remains so to this day). Coincidentally, Elizabeth II became the ruler precisely during the same year (1952), and was crowned next year, after the nuclear test. Despite the fact that Australia was at that time formally not much more closely linked to the UK than it is today, the Australians nonetheless allowed the British to conduct nuclear weapons tests on their territory. The test was conducted on the Montebello Islands, which are located less than 100 km away from the northwestern Australian coast. In other words, the islands lie at almost the exact opposite point of the continent from Sydney and Melbourne. The British bomb contained around 7 kg of plutonium and produced an explosion of over 25 kilotons. 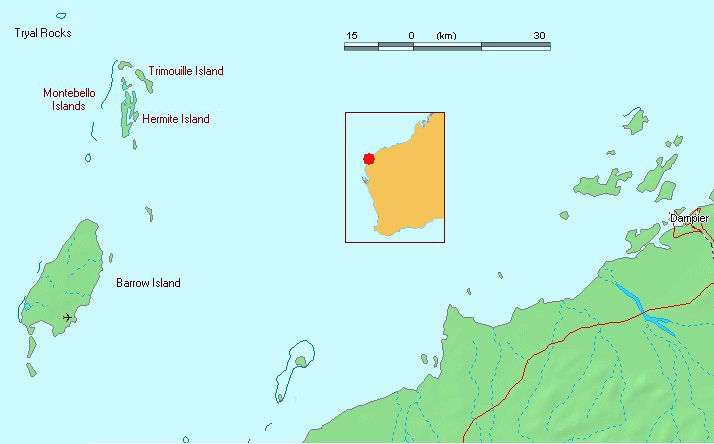 The bomb was detonated in a lagoon at the aforementioned Montebello Islands. It was placed in an old warship, the frigate HMS Plym. Of course, the explosion completely annihilated the ship. Allegedly, the reason for using the ship was to test what would happen if someone tried to smuggle a nuclear bomb into the country (a scenario the British were worried about).